Hydrometers and refractometers are essential equipment for saltwater aquariums. These testing devices are used to maintain the ideal specific gravity (SG) for your marine aquarium fish, corals, and other invertebrates. Refractometers always make a great gift for almost any marine aquarist. 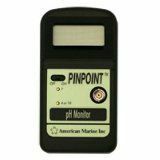 American Marine Pinpoint Salinity Monitor continuously measure dissolved salt levels in your aquarium. Accurately reads aquarium salt levels in millisiemens (mS), but includes a chart to cross-reference both specific gravity (S.G.) or % salt (ppt). The reading is fully temperature compensated for true readings of salt levels. Includes a 53.0 mS reference/calibration fluid. Floating glass hydrometer for measuring aquarium specific gravity Extremely simple-to-use hydrometer for fast and effortless testing Monitor and maintain proper specific gravity in saltwater aquariums Extreme ease of use makes the standard floating hydrometer a classic favorite. Measuring aquarium specific gravity is as simple as floating the Sera Marin Hydrometer in your marine aquarium. Features measurement range of 1.000-1.040 with graduation increments of 0.01. The Sera Marin Hydrometer is calibrated at 77 degrees Fahrenheit and measures 5/8 diameter x 6-1/2. Please click on More Information for tips on testing. Compact swing-arm hydrometer ideal for all saltwater aquariums Use for periodic or continuous salinity, and specific gravity readings Certified calibration for accurate measurement of aquarium salt levels Know aquarium salt levels at a glance without obstructing beautiful views. Compact Mini Hydrometer is the smart, space-saving solution that allows discreet and accurate measurement of aquarium salinity and specific gravity. This submersible swing-arm hydrometer measures only 2-3/8 x 1-7/8 and 5/8 thick, roughly the size of a matchbook. Use as an in-tank hydrometer for continuous readings or remove it for periodic routine readings. The unique, patented design of Red Sea's hydrometer enables it to be installed inside the aquarium or sump. It gives a continuous "real-time" reading of the specific gravity. Also, it can be used as a typical hydrometer for periodic measurements. Designed for research grade analysis, the Hanna Instruments Digital Seawater Refractometer is a rugged portable, water resistant device that utilizes the measurement of the refractive index to determine the salinity of natural and artificial seawater, ocean water or brackish intermediates. Easy-to-read digital display for fast results. The ATC Seawater Refractometer accurately measures the salinity of seawater on 2 scales: Specific Gravity (D 20/20) and parts per thousand (‰). This rugged seawater refractometer comes in a durable case and includes a water dropper, cleaning cloth and screwdriver. The Red Sea Refractometer directly reads the absolute salinity of seawater at 25°c/77f (no need for seawater or temperature compensation factors). Simple, fast calibration.